We travelled from Marrakech to Essaouria by taxi, with views of arid farmland and desert. We broke up the journey with a short stop at a roadside cafe which had invested in decent toilets – judging by the coach loads arriving and departing this was a good decision. Outside Essaouria, high overlooking the city we were surprised to see how big it was. The other surprise was that we could not see the sea. The reason became clear as we drove along the modern beach resort, a thick sea mist was rolling in from the Atlantic, hiding the view of the sea, port and Medina. A bit of a mysterious start to our stay. The Riad here was really old, set off from the main thoroughfare, down a dark alley. Due to the Atlantic weather they have a glass roof over the traditional courtyard and this made the place a little dank. However, the roof terrace was excellent and we made it our afternoon studio. The people who ran the Riad were lovely and we made the most of their welcome. Following a lovely meal in the evening and a quick reconnoiter we made a good start in the morning, where we found a wonderful view of the city walls and a good place to paint from. 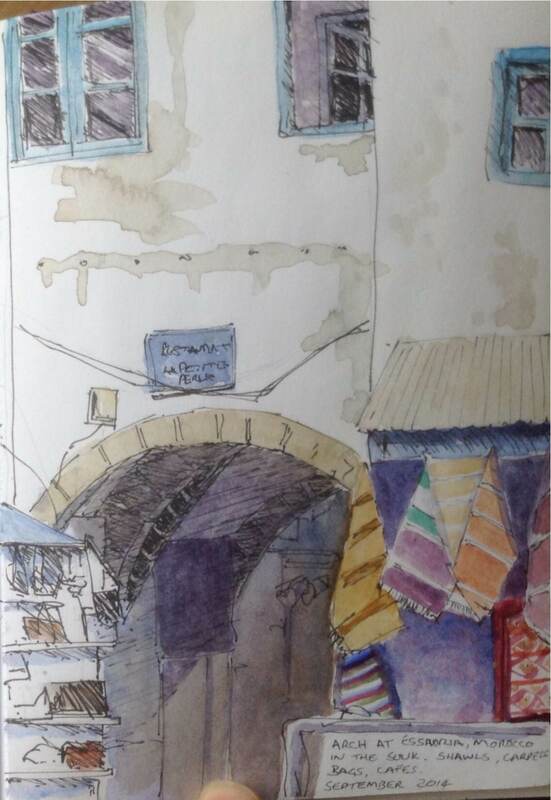 Below is my line a wash sketch from that morning, with the colour washes laid the following day. I was relieved to get a better picture in my book and pleased with the way it looked. Using the birds really made the picture come alive. 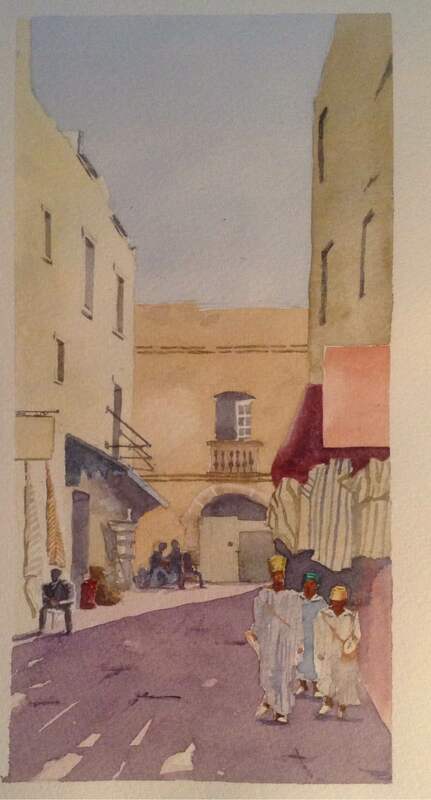 In previous posts I’d been following the work that Sir Edmund Seago had produced in Morocco and I had it in my mind to produce one in Essaouria. 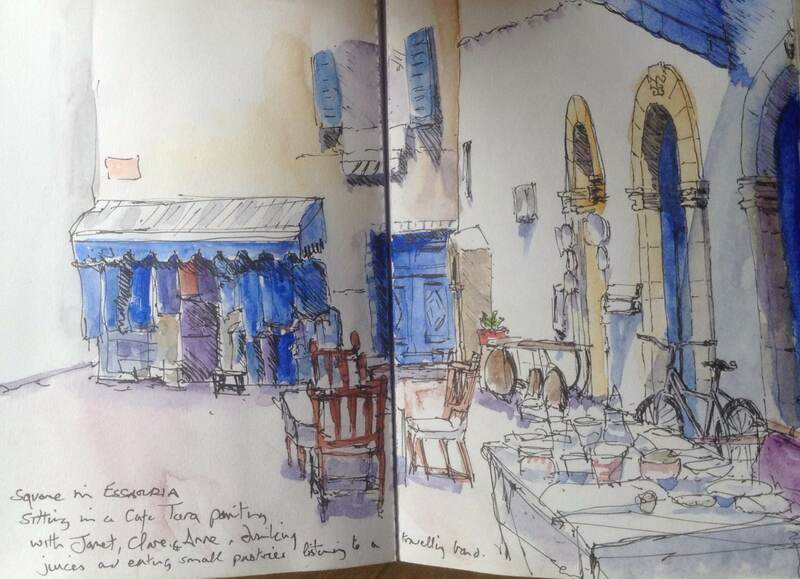 We had eaten in a lovely friendly restaurant in the Medina and the passageway it was located in had potential from a painting point of view. So I took pictures and painted the scene in my book from our roof terrace ‘studio’. No matter where we sat in the city there was a group of musicians looking for dirams, so I took a photo and added them in the picture. This is not a pure Seago but I will give this another attempt using more contrast. 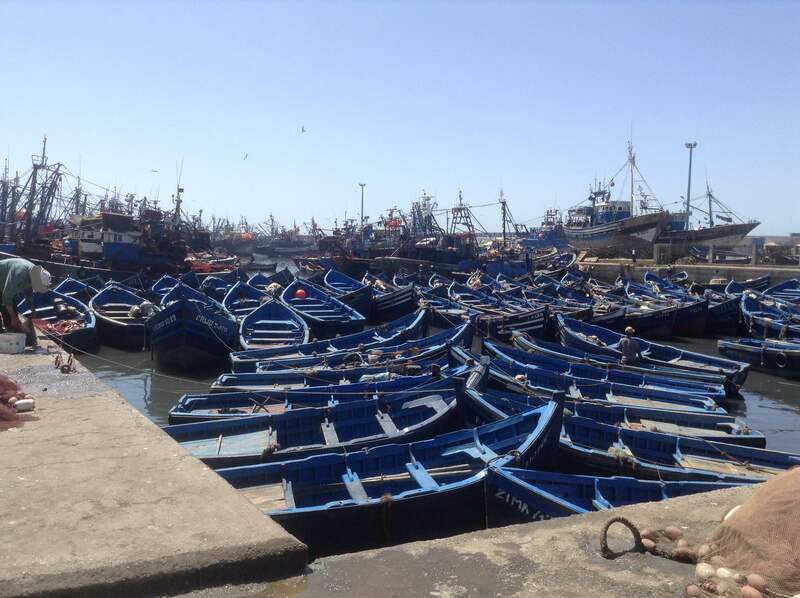 With a couple of pictures in the book I returned to the port to search of a scene with fishing boats. I like painting boats and thought I could get a good picture using sky, boat, water and some workers. This is what I found…. This was too much for me and so I turned around and looked for a view at the fort. For 10 dirams we could walk the port’s ramparts and tower. The open area of the fort, above the port, provided me with a wonderful panorama of the fish market, city and walls. There are several small items in this painting that will remind me of Morocco and especially Essouria, the cat waiting for a fish in the port (and elsewhere in city), the gulls wheeling above looking for the remains of the day’s catch, the red and green flag of Morocco and the two baggage karts that seem to be everywhere in the cities. Everywhere we ate in Morocco we had good food. My tummy was not quite aligned with the local cuisine but it didn’t stop me doing or eating anything. I had soups, salads, sausages, tagine and tagina but my favorite were the pastilles. Puff pastry parcels of chicken or fish in a cream sauce, powdered with icing sugar and cinnamon. Delicious. The cafes were also very enjoyable and we spent long lunches eating, drinking fruit juice cocktails and sketching whatever view was available. Here are couple from my small sketchbook. 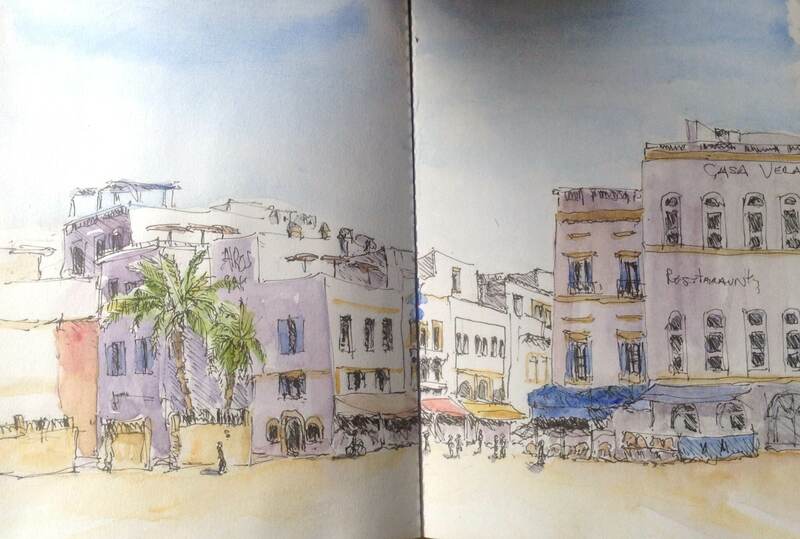 On my last day I went in search of a quick sketch of the town square. I found some shade and stood for about 20 minutes. I didn’t get hassled once and this view reminds me of a lovely and creative time in Essaouria. My next post will be on our return to Marrakech. Looking forward to reading part 3! More please.